AirPlay Mirroring is a fantastic feature of iOS on the iPad. It lets you mirror your iPad screen, and everything that you do on it, to an Apple TV or a Mac computer. This is hugely useful when doing presentations and demos, creating screencasts or videos, or just enjoying your iPad photos or videos or games on a bigger screen. — An iPad 2 or later, running iOS 5 or later. — If you want to mirror to Apple TV: An 2nd gen or 3rd gen Apple TV running software version 5 or later. Two apps that enable mirroring to a Mac from an iPad are Reflector and Air Server. Both offer free trials, are available for $14.99 for a single user license, and have other licensing packages for multiple users. Both these apps also work on Windows PCs. — A WiFi network. All devices taking part in the AirPlay Mirroring must be on the same local WiFi network. — Bring up the MultiTasking Bar on the iPad. Do this by double-tapping the Home button or by using a swipe up gesture from the bottom bezel, if you have enabled multitasking gestures in Settings. — Then swipe on the recently used apps list once or twice from left to right until you see the AirPlay Mirroring icon. 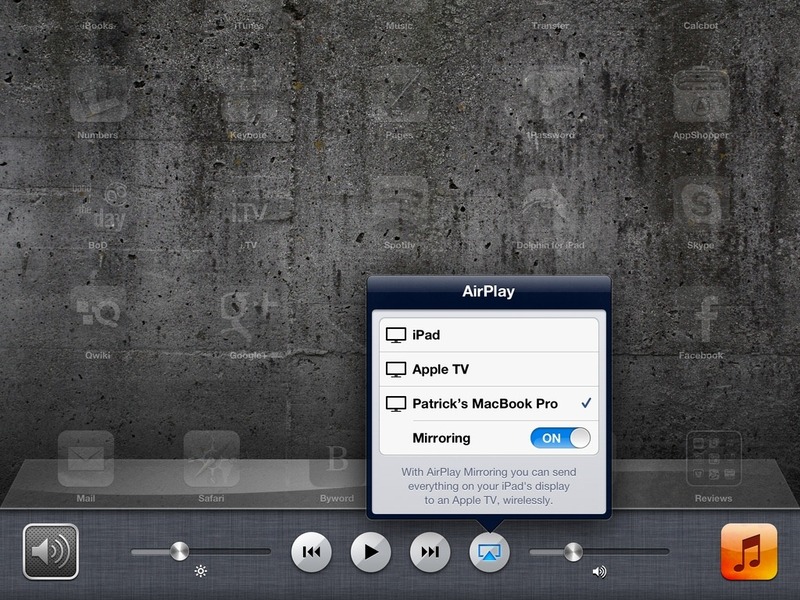 — Tap on the AirPlay Mirroring icon. This will bring up a popover dialog showing you an entry for the iPad and any Apple TV or Mac that is available to mirror to on your WiFi network. Please note that on a Mac you will need to have either the Reflector or Air Server app open in order for it to be available to mirror to. — Tap to select either the Apple TV or the Mac and tap to toggle the Mirroring button below the device name to On. — To turn off mirroring you bring up the Multitasking Bar again, swipe left to right to reveal the AirPlay Mirroring icon (just as you did above), tap on the AirPlay Mirroring icon, and tap on the entry for the iPad. That’s it. This really is a superb feature that’s ever so easy to use. This is a great post. I am not sure if your followers are aware of a simple tool called Reflector which allows you to mirror your iPhone or iPad onto a PC. It is really simple. Go to https://www.reflectorapp.com/ to see how. That’s the app that is mentioned and linked in the post. Been a fan for a while now, love your site… thanks! Thanks for the post. I understand that with Mountain Lion you can mirror your Mac to an Apple TV. I don’t understand how this stuff works really, but would that mean you won’t need Apps like Air Server to mirror your iPad to your Mac, or are those two separate things? No it doesn’t mean that. 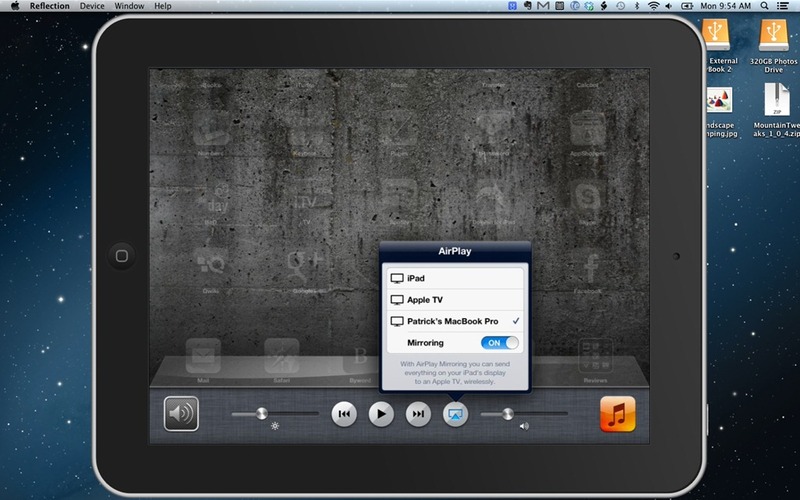 Mountain Lion enables AirPlay Mirroring *from* the Mac to Apple TV. Apps like Reflector and Air Server enable AirPlay Mirroring *to* the Mac from iPad. So this means that my macbook from 2009 does not work on apple tv gen 3? How do I mirror what is on my iMac sceen to apple tv? Just got Mountain Lion and apple tv. Hey Jordan as i double tap on my iPad 2 i don’t find that Airplay button itself. Do i need to install anything in my device?? or any other problem?? Please reply..
From personal tests, I found that AirPlay mirroring (with Reflector) does not work on any given WiFi network. Does somebody know more about that? It works with my Apple AirPort Extreme at home (duh! ), but not with the public WiFi at work. The public Wifi is often separate from the internal network. That could be why. I cant seem to figure this out. I downloaded the reflecter application to my windows 7 pc but all it will allow me to do is stream audio. It never gives me the option to miorr the screen to my pc. Any recomdations. Is that happening in all apps or just in a specific app? I’ve never seen that issue at all with the Mac app. It goes into reading mode, reading everything I tap. I have to tap 4 or 5 times for the app I want to come up and again have to tap innumerable times to get anything to work. Some things won’t work at all. On both occasions I have had to Backup and restore my Ipad. This is a lengthy procedure and a little bit worrisome the first time! However, as it worked perfectly the first time, I was less anguished the 2nd time. But the conclusion is: KEEP AWAY FROM USING THE SWIPE PROCEDURE TO GET AIRPLAY. There has to be another way! I’m sorry to hear you’ve had such major issues with your iPad, but AirPlay Mirroring is a long-established and incredibly useful feature on the iPad – and invoking it from the Multitasking Bar is the standard that’s been in place since Day 1. I find it very hard to believe that it is the cause of your issues and I see no reason at all to advise people to avoid it. The airplay icon does not show up on my iPad (and believe me, I have tried every trick mentioned in the various forums and support communities). The frustrating thing is, it was working a couple of months ago. I am trying to mirror my iPad onto my desktop mac. Any suggestions? Thanks! Simple, easy to understand instructions. Thanks Patrick you just made my day wonderful.